Particulate matter in smoke can aggravate asthma and pose a risk to your heart. 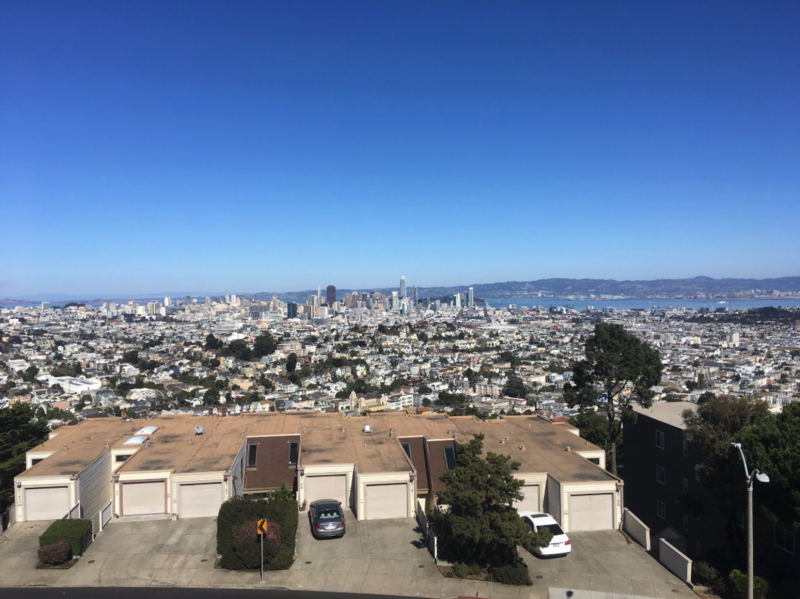 LEFT: San Francisco on a clear day in October 2017. RIGHT: San Francisco on Friday, Nov. 16, 2018. Millions of people in Northern California are suffering through some of the worst air pollution in the world due to all the smoke and ash generated by the raging wildfires. After a week of smoky skies, with no relief in sight yet, experts are warning of health consequences. 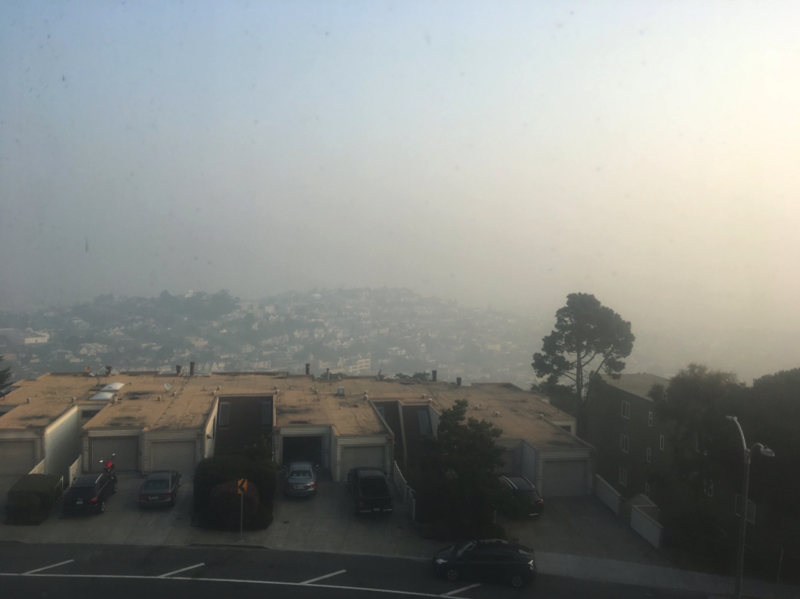 In San Francisco, for example, the air is so bad that schools closed on Fridays, buses have temporarily replaced the open-air cable cars, museums are waiving entrance fees, and health experts are warning people to stay indoors. The Bay Area Air Quality Management District is warning the bad air could last until at least next Tuesday. California’s most deadly and damaging fire ever erupted north of Sacramento last Thursday and destroyed the town of Paradise. The massive, fast-moving Camp fire has destroyed more than 12,000 structures and resulted in at least 63 deaths. More than 600 other people are still missing. Only about 45% percent of the Camp fire was contained on Friday, according to state officials, and there are several other fires burning across the state, including the damaging Woolsey fire in Southern California. All of this burnt material is getting up in the air, and being swept across the state. So now people living more than 100 miles away are experiencing smoky skies and finding it hard to breathe. “The reason our air looks and feels and tastes unusual to us is because there are particulates from the fires traveling in smoke,” said Brent Andrew, a spokesperson for Zuckerberg San Francisco General Hospital and Trauma Center. And small particulates in the ash and smoke pose a big health risk because they can get lodged inside the lungs and other parts of the body. The resulting short-term impacts for people may include trouble breathing, asthmatic flare-ups, and tightness in the chest. Some people may also experience heart problems. Another health risk posed by the burning of homes and structures, as opposed to just burning vegetation, is the incineration and vaporization of nasty stuff inside buildings, such as metals and leads, Robert Gould, a pathologist on the board of directors for the group Physicians for Social Responsibility, told BuzzFeed News. According to Kaiser Permanente, there’s been a slight increase in the number of patients coming in recently with respiratory problems to their emergency departments in the Bay Area due to smoke in the air from the Camp fire. One way to measure particulate matter levels in the air and its impact on air quality is using what’s called the air quality index. Any values above 100 mean levels of dangerous air pollutants — known as particulate matter 2.5 — are above the federal limit, according to the Bay Area Air Quality Management District website. On Friday, levels got up to at least 239 in San Francisco, 267 in San Pablo, 190 in San Jose, and over 200 in Oakland. PurpleAir, another resource for air monitoring, has been showing even higher levels, such as above 300 in parts of San Francisco and above 500 in the Chico area. And real-time monitoring of the globe by Berkeley Earth shows California’s levels of particulate matter stand out, with much of the northern and central sections of the state shaded in orange (unhealthy for sensitive groups), red (unhealthy), or purple (very unhealthy). If you’re in an impacted area, health experts recommend staying indoors, especially in buildings with circulated air, and wearing specific masks when going outside. “Wildfire smoke is really unhealthy for people in the sensitive groups — children, the elderly, people like myself who have respiratory disease, heart disease — and so we have to take extra precautions to stay out of it,” former EPA official John Kennedy told BuzzFeed’s AM to DM on Friday. “This air quality is affecting a very large number of people,” Morello-Frosch said. And even though the exposure isn’t long-term, like in India and China, where it’s chronically bad, she explained, the acute effects could happen more frequently as more and more damaging fires occur in a warming world.